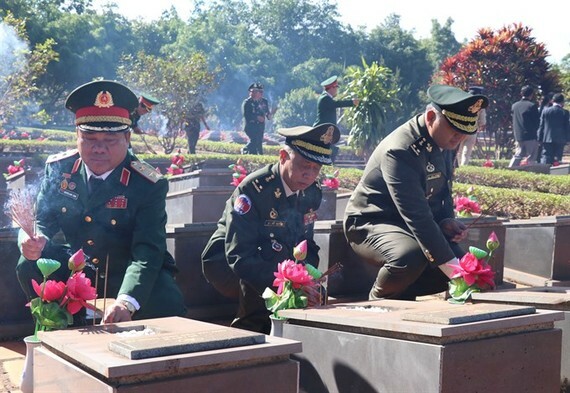 A ceremony marking the 40th anniversary of the victory of the southwest border defence war and the joint victory of Vietnam and Cambodia over the genocidal regime (January 07) was held yesterday in Hanoi. General Secretary of the Communist Party of Vietnam Central Committee (CPVCC), President Nguyen Phu Trong; former CPVCC General Secretary Le Kha Phieu; Prime Minister Nguyen Xuan Phuc; Party and State leaders of Vietnam and Cambodia along with war veterans attended the event. Opening the ceremony, Prime Minister Phuc said the victory 40 years ago was a joint triumph of both countries as well as of the world. The victory demonstrated the courage and strength of Vietnamese people, showed a close-knit, loyal, traditional friendship, pure-hearted and wholehearted assistance of the Vietnamese Party, State, Army and people to Cambodian people. The victory eradicated the genocidal regime and opened a new era of development, independence, freedom, peace and prosperity for Cambodia, he said. After years of trials with hundreds of thousands of documents and evidence collected, a verdict issued on November 16, 2018 found Khmer Rouge leaders guilty of genocide, almost 40 years since Pol Pot’s brutal regime fell. The judgment had brought justice to innocent victims being killed by the genocidal regime and asserted the just support of Vietnamese voluntary soldiers, Phuc said. “The Vietnamese Party, State and people will never forget services of Vietnamese volunteer officers, soldiers and experts who overcame challenges, even sacrificed their blood and lives to defend the southwest border of the country,” he said. A series of monuments which commemorate services of Vietnamese experts, voluntary soldiers, Cambodian people and army forces were inaugurated in both countries as symbols of the consolidation of the two countries’ friendship, he said. Looking back 40 years after the victory, Phuc expressed his pleasure to see Cambodia among few countries in the world that, after receiving assistance from another country, could strive forward to take over the mission of protecting and building the nation. The success of Cambodia’s sixth National Assembly election in July this year with the victory of the Cambodian People’s Party had demonstrated progress made in the country. The border area of Vietnam and Cambodia which was devastated during the war had become a peaceful area of friendship and co-operation. The two countries had completed 84 per cent of the border demarcation and marker planting-related work and hoped to finish the work quickly, Phuc said. Phuc also expressed his hope young Cambodians who are studying at Vietnam would continue to preserve and develop the noble tradition, contributing to nurturing the two countries’ solidarity. Following the tradition of solidarity inspired by the joint victory, the Government leader expressed his optimism over the “good neighbours, traditional friendship, and sustainable, long-term, comprehensive co-operation” with an array of potentials. On behalf of Cambodia’s National Assembly, Senate, Government, Solidarity Front for the Development of Cambodian Motherland and Cambodian people, he expressed deep and sincere gratitude to the Vietnamese Party, State, Fatherland Front, army forces and people for their great sacrifices to save Cambodia from the genocidal regime and help them gain liberation. “The timely and effective support of Vietnam has contributed to helping Cambodia get out of war devastation and step into an era of peace, unification and development in all sectors,” he said. In the current period of peace, stability and development, the relationship between the two neighbours had been continuously consolidated with regular State visits, he said. Tep Ngorn mentioned the boosted collaboration in commerce, investment and tourism as examples for fruitful results of bilateral co-operation. He also delivered thanks for Vietnam’s assistance to Cambodia in constructing and developing the country, including financial assistance in education to develop human resources, infrastructure, energy, and tourism. Forty years after the victory on January 7, 1979, the friendship and co-operation between Vietnam and Cambodia has been strengthened by generations of leaders and people of the two countries, bringing practical benefits to both countries. Over the past years, the two sides have regularly exchanged high-level delegations, officials from ministries, sectors and localities as well as people to promote long-standing friendship and comprehensive cooperation in a deeper, more efficient and reliable manner. Last year, the two sides exchanged issues relating to bilateral cooperation at international conferences such as the second Mekong-Lancang Co-operation (MLC) Summit in Phnom Penh in January as well as the sixth Greater Mekong Subregion (GMS-6) Summit and the 10th Cambodia-Laos-Việt Nam Development Triangle Summit (CLV-10) in Hanoi in March. The two sides also held the 16th meeting of the Vietnam-Cambodia Joint Committee on Economic, Cultural and Scientific-Technological Co-operation; signed several new co-operative agreements and inaugurated the radio stations funded by Vietnam in Cambodian provinces. Cooperation in the fields of economics, trade and investment have been increasingly developed. Bilateral trade reached US$3.8 billion in 2017, a year-on-year increase of 30 per cent. In the first 11 month of 2018, bilateral trade reached $4.3 billion. Vietnam has now 210 investment projects in Cambodia with a total registered capital of US$3 billion. Cambodia has always been among the top three markets to attract Vietnam’s investment abroad. In addition, in recent years, the tourism industry of the two countries has become a field attracting a lot of investment and human resources. 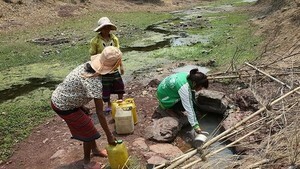 Vietnam has the second largest number of tourists coming to Cambodia. In the first 10 months of 2018, there were about 500,000 Vietnamese tourists visiting Cambodia. In the opposite direction, in 2017, Cambodian visitors to Vietnam reached 222,000. Co-operation in border management between Vietnam and Cambodia has been fostered. The two countries have maintained joint patrols, timely exchange information and co-operate with each other to handle arising issues. Both sides are striving to complete the demarcation of their land border in the shortest time possible to build a borderline of peace, stability, friendship, co-operation and sustainable development. Co-operation between relevant ministries, branches and localities of the two countries has also been promoted. Vietnam and Cambodia co-ordinated closely in regional and international co-operation frameworks such as the United Nations, ASEAN, ASEM, the Greater Mekong Sub-region and the Cambodia-Laos- Vietnam Development Triangle.